Six siductioneers spent the last weekend at CLT 2015, the annual Linux conference at Chemnitz University. First of all, let me thank the people who organized this conference for the 17th time and of course all the helper bees that make it the most pleasant event on the annual Linux calendar. Just to give you an idea, here is some numbers. Besides a lot of workshops, more than 90 talks on a wide variety of subjects were held, 60 projects like siduction could exhibit the soft- or hardware or the services they offer. Between the two days of work and hacking, Linux-Night offers socialising, food, drink and music. It was nice to see that the place was packed and bursting at the seams with visitors on both days. We had a successful weekend and tons of fun. Besides answering questions or solving problems of visitors at our booth we were able to roll out some ideas for the future of siduction that you will learn about soon. Besides that we were paid a visit by some people from the distant past of our project. Klaus Knopper and also Kano from Kanotix came by our booth to say hello. Knopper was doing some inquiry on how to tame systemd for Knoppix, which is not all that easy due to the nature of the scripted way in which Knoppix boots. We were able to provide some help and advice here and put aside some of his worries in that regard. Both of them might be helpful to us in porting siduction to ARM devices. We supplied Kano with a developer board where he can play with porting stuff from other architectures. So with Knopper and Kano there and our pals from Debian right next to us, we had the full circle from the Knoppix/Kanotix origins to Debian Stable and beyond to the save haven of siduction. 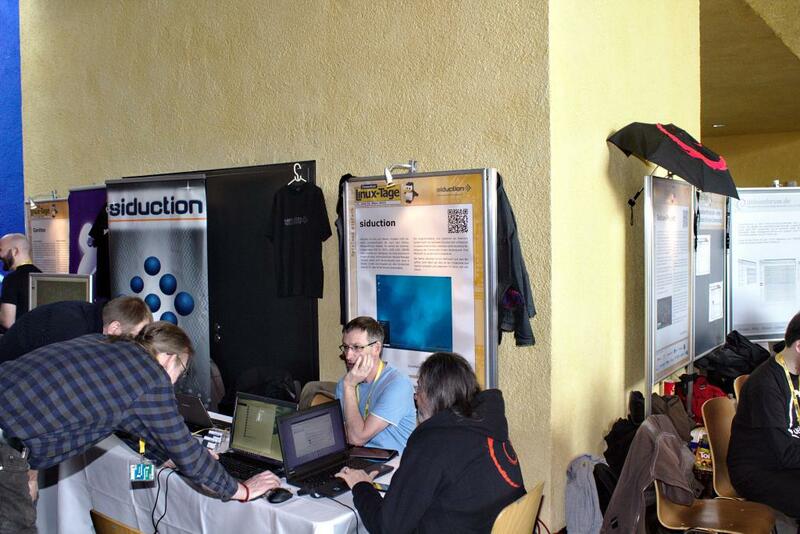 Besides that we managed to talk to our server provider Hetzner, whose company was also present with a booth. They will upgrade our hardware for web- and buildserver in the course of 2015 free of cost and for the same fee as we pay now. We also worked on some ideas on how to attract new developers to siduction, which is a problem that in the long run we will need to solve for sure. Too much work is on just a few shoulders right now. Things we need to attack soon involve UEFI installs and, regarding the latest news from linux-loving Microsoft, we might have to deal with secure boot as well. One of the ideas to attract new blood is to rent another server and donate slices of that to developers and projects who need some iron to work on for a fixed time frame. Our terms for this would be, that people who want to use our offer at least have a look at our project and consider a list of problems we want to tackle and help a bit with that, if they can. What we did not do on this weekend was taking pictures. I left my camera at home and noone else had one either. So this article has the only photo of our booth that I could find on the net. But that is ok, facts are more important than pics :). Some Debian folks invited us to DebConf, which is held in August for the first time in Germany. Besides that we will visit another young Linux fair called Open-Rhein-Ruhr and that takes place in November in the city of Oberhausen. This entry was posted in Blog and tagged CLT 2015 on 2015/03/23 by Ferdinand Thommes.